I’m looking forward to seeing ‘The Hunger Games’ in the next little while. I’ve read the whole trilogy, which I enjoyed very much, and which reminded me of some other stories in a similar vein. 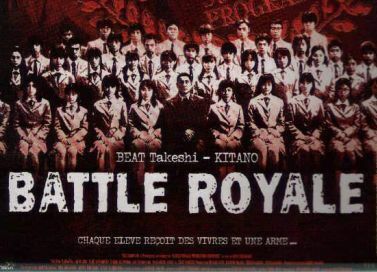 If you find children slaughtering each other to be as entertaining as I do, see if you can find ‘Battle Royale‘, a Japanese film in which an entire class of students gets strapped with explosive collars before being placed on an island for three days. If more than one of them survives, the collars will be detonated. Bonsai! The story’s protagonist, Ben Richards, is a citizen of Co-Op City, a suburb of the fictional Harding, which is located somewhere in the Midwest, west of Detroit (not to be confused with the real Co-Op City) in the year 2025. The world’s economy is in a shambles and America has become a totalitarian dystopia. Richards is unable to find work, having been blacklisted from his trade, and needs money to get medicine for his gravely ill daughter Cathy. His wife Sheila has resorted to prostitution to bring in money for the family. In desperation, Richards turns to the Games Network, a government-operated television station that runs violent game shows. After rigorous physical and mental testing, Richards is selected to appear on The Running Man, the Games Network’s most popular, lucrative, and dangerous program. These stories all have one common element. In each, the hero not only survives against overwhelming odds, but manages to strike a fatal blow against the tyrannical oppressor. Even if you’re not libertarian, what’s not to love? So you do know Running Man. Isn’t the antagonist Dan Killian. Anyhow, that is what I am reminded of whenever I see you name.